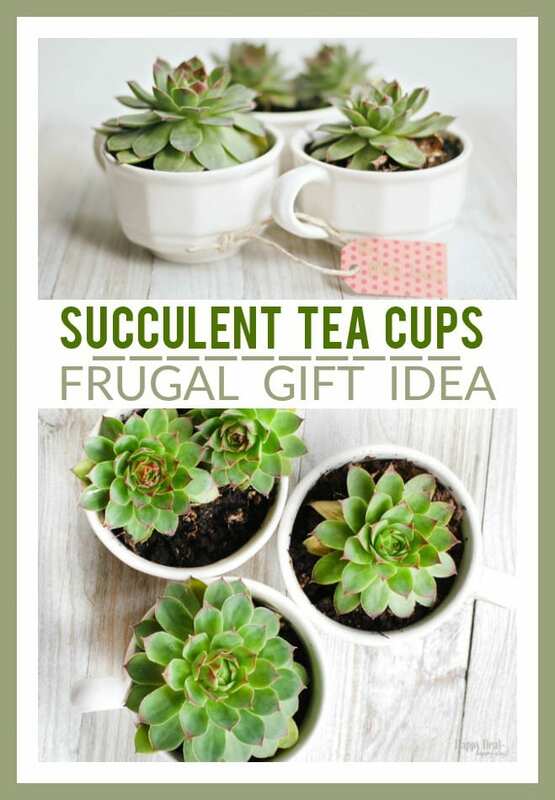 Succulent Tea Cups | Frugal Gift Idea | Happy Deal - Happy Day! When I first moved into my house 10 years ago, a friend of mine gave me some Hens and Chicks succulent plants as a house warming gift. These are one of the hardiest plants I’ve ever had and they spread like crazy! 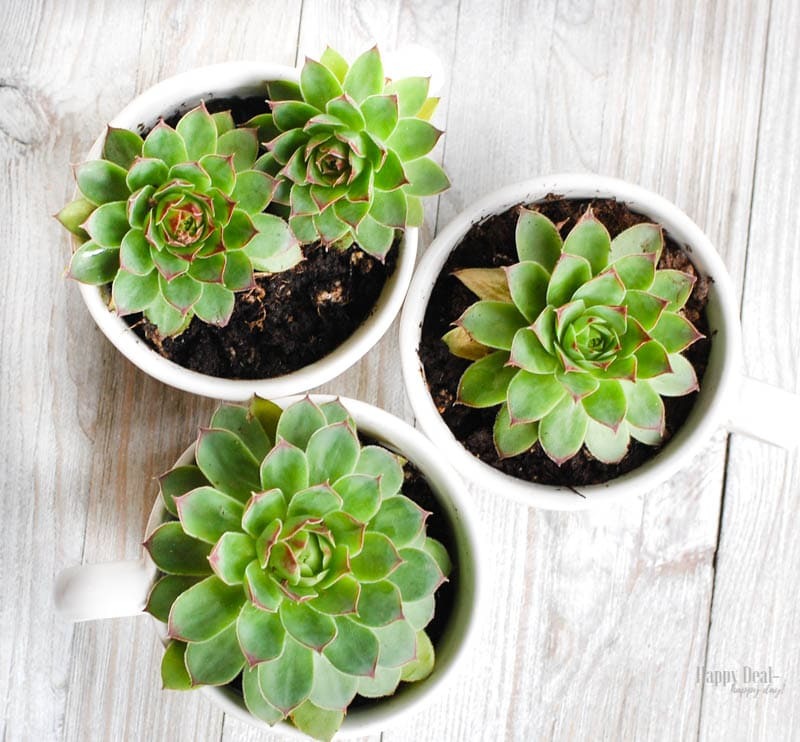 Sempervivum is their scientific genus, which literally means “live forever” because they grow and propagate so readily. If you look at the picture above, you see a larger bloom in the center – that’s the hen. Then new “chicks” bud off and create new blooms. 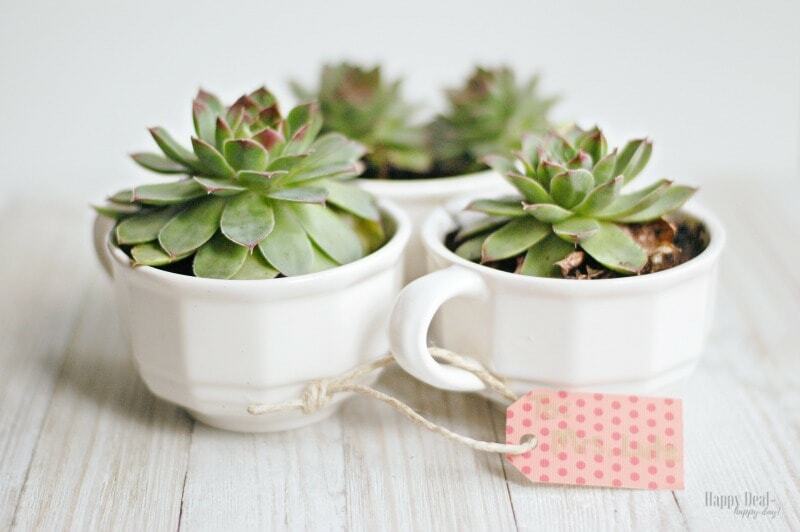 Now that succulents are the current “trendy” plant – here’s a great way to re-gift them using white tea cups I found at a thrift store! 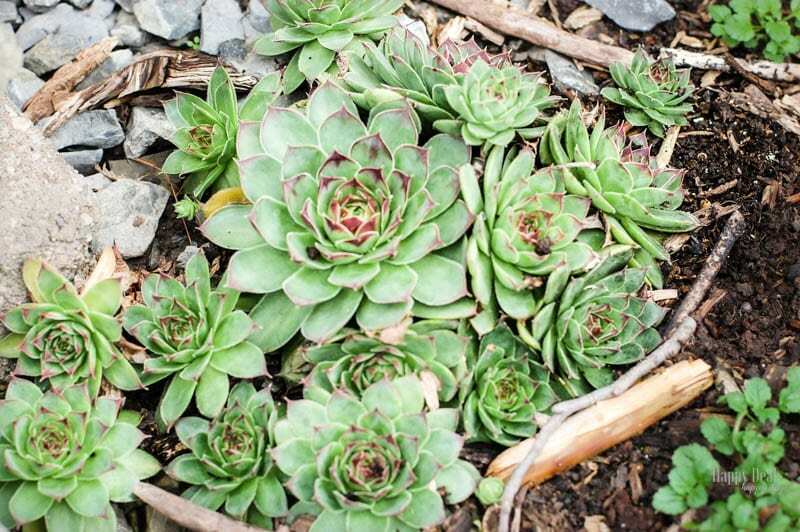 Hens and chicks succulent plants – if you don’t have these in your yard, plant them now and they will reproduce and last a lifetime as you can easily pull off buds and replant them as gifts forever! EK Tools Tag Punch – I use this with scrapbook paper to make gift tags. 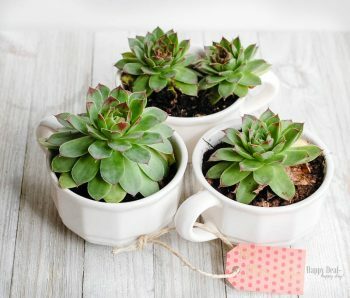 Replant your Hens and Chicks into tea cup succulents, just pull off a “chick” and add it to a tea cup with some soil in it. Offsets, or “chicks,” root quickly and contact with soil is enough for them to start growing. 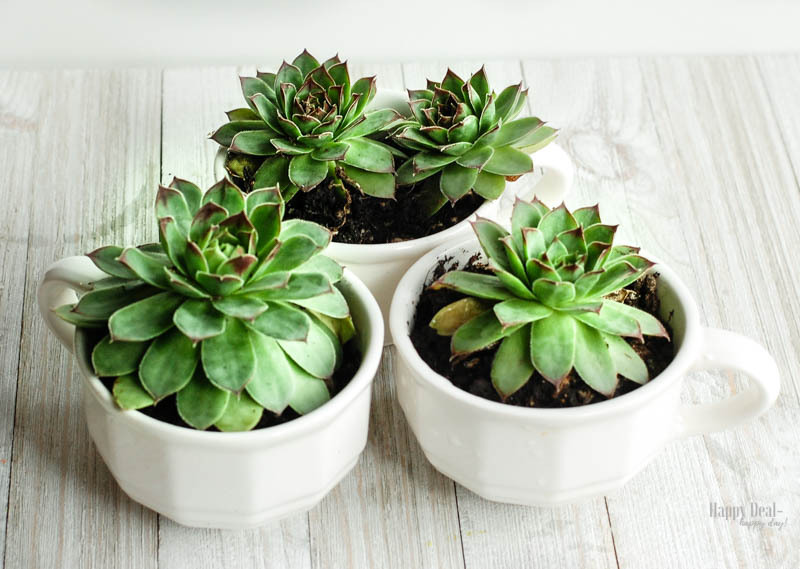 These plants are also drought tolerant, so if your friend you are gifting these too does not have a green thumb or forgets to water, then this is the best kid of plant to give! I used a gift tag scrapbook punch with some scrapbook paper. Then I punched a hole with a hole puncher and tied on twine. Now my kids can write messages to their teachers as these will be part of this years teacher Christmas gifts! 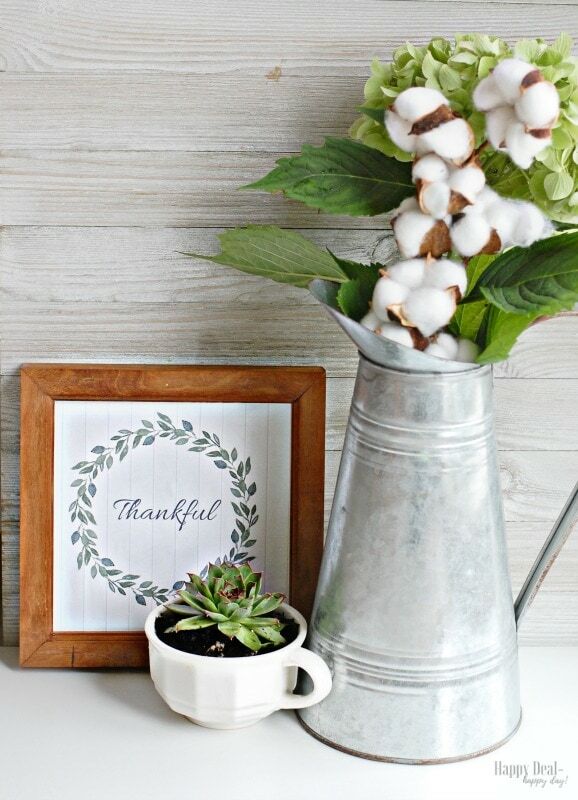 This plant is so versatile with your decor since it is in a neutral cup and can go with any tablescape. 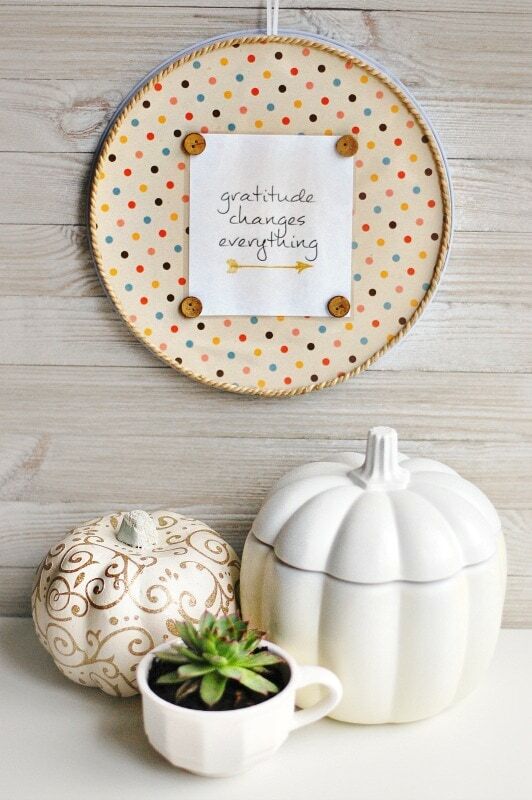 I currently like mine near my “Thankful” printable I created – which you can print and frame one for yourself as well! 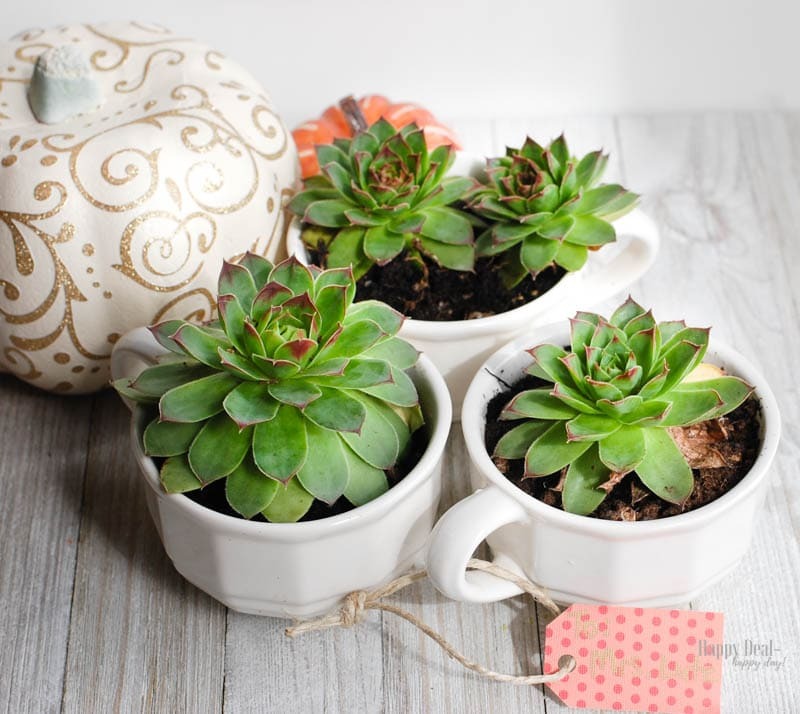 This succulent also goes great with my “Gratitude Changes Everything” – More Decorating for Fall On A Budget Ideas! Homemade Note Cards Using Shaving Cream & Food Coloring! ← Printable $0.55/1 Meow Mix Cat Treats Coupon = Just $0.49 at Wegmans! Very cute gift idea! Succulents are my fave so these are right up my alley. 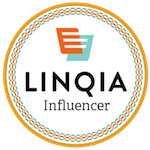 Visiting from Share Your Style party.